During the late 1960s, the United States learned that the Soviet Union had embarked upon a massive Intercontinental Ballistic Missile (ICBM) buildup designed to reach parity with the United States. In January 1967, President Lyndon Johnson announced that the Soviet Union had begun to construct a limited Anti-Ballistic Missile (ABM) defense system around Moscow. The development of an ABM system could allow one side to launch a first strike and then prevent the other from retaliating by shooting down incoming missiles. Johnson therefore called for strategic arms limitations talks (SALT), and in 1967, he and Soviet Premier Alexei Kosygin met at Glassboro State College in New Jersey. Johnson said they must gain “control of the ABM race,” and Secretary of Defense Robert McNamara argued that the more each reacted to the other’s escalation, the more they had chosen “an insane road to follow.” While abolition of nuclear weapons would be impossible, limiting the development of both offensive and defensive strategic systems would stabilize U.S.-Soviet relations. Johnson’s successor, Richard Nixon, also believed in SALT, and on November 17, 1969, the formal SALT talks began in Helsinki, Finland. Over the next two and a half years, the two sides haggled over whether or not each nation should complete their plans for ABMs; verification of a treaty; and U.S. concern that the Soviets continued to build more Submarine-Launched Ballistic Missiles (SLBMs). 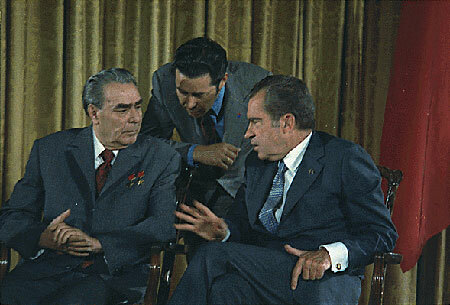 Nixon and Soviet General Secretary Leonid Brezhnev signed the ABM Treaty and interim SALT agreement on May 26, 1972, in Moscow. Negotiations for a second round of SALT began in late 1972. Since SALT I did not prevent each side from enlarging their forces through the deployment of Multiple Independently Targeted Re-Entry Vehicles (MIRVs) onto their ICBMs and SLBMs, SALT II initially focused on limiting, and then ultimately reducing, the number of MIRVs. Negotiations also sought to prevent both sides from making qualitative breakthroughs that would again destabilize the strategic relationship. The negotiations spanned the Nixon, Gerald Ford, and Jimmy Carter administrations. At the November 1974 Vladivostok Summit, Ford and Brezhnev agreed on the basic framework of a SALT II agreement. This included a 2,400 limit on strategic nuclear delivery vehicles (ICBMs, SLBMs, and heavy bombers) for each side; a 1,320 limit on MIRV systems; a ban on new land-based ICBM launchers; and limits on deployment of new types of strategic offensive arms. Even after the Vladivostok agreements, the two nations could not resolve the two other outstanding issues from SALT I: the number of strategic bombers and the total number of warheads in each nation’s arsenal. The first was complicated by the Soviet Backfire bomber, which U.S. negotiators believed could reach the United States but which the Soviets refused to include in the SALT negotiations. Meanwhile, the Soviets attempted unsuccessfully to limit American deployment of Air-Launched Cruise Missiles (ALCMs). Verification also divided the two nations, but eventually they agreed on using National Technical Means (NTM), including the collection of electronic signals known as telemetry and the use of photo-reconnaissance satellites. On June 17, 1979, Carter and Brezhnev signed the SALT II Treaty in Vienna. SALT II limited the total of both nations’ nuclear forces to 2,250 delivery vehicles and placed a variety of other restrictions on deployed strategic nuclear forces, including MIRVs. However, a broad coalition of Republicans and conservative Democrats grew increasingly skeptical of the Soviet Union’s crackdown on internal dissent, its increasingly interventionist foreign policies, and the verification process delineated in the Treaty. On December 17, 1979, 19 Senators wrote Carter that “Ratification of a SALT II Treaty will not reverse trends in the military balance adverse to the United States.” On December 25, the Soviets invaded Afghanistan, and on January 3, 1980, Carter asked the Senate not to consider SALT II for its advice and consent, and it was never ratified. Both Washington and Moscow subsequently pledged to adhere to the agreement’s terms despite its failure to enter into force. Carter’s successor Ronald Reagan, a vehement critic of SALT II during the 1980 presidential campaign, agreed to abide by SALT II until its expiration on December 31, 1985, while he pursued the Strategic Arms Reduction Treaty (START) and argued that research into the Strategic Defense Initiative (SDI) adhered to the 1972 ABM Treaty.